Yicheng Luo - Yo-Yo Design at its Finest! The first thing you notice in this unique design is the cuts in the catch zone - These reduce the exposed surface area and drastically cut down string friction to maximize spin time while maintaining an ideal weight distribution. This gives you a comfortable organic profile that will effortlessly blaze through horizontal tricks. Then take a look at the cool cup design - Those circular notches aren't there just for aesthetics! 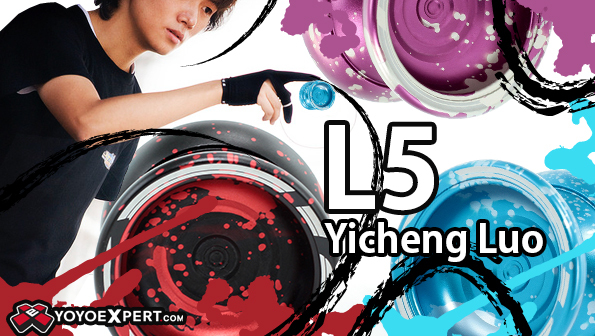 With the finger spin tricks growing in popularity, the L5 was created to be a finger spinning machine! The cup is designed with carefully machined stepped down notches that guide your finger to the center for perfect finger spins. You can tell every little detail was considered on the L5 - even the packaging is extraordinary! This custom wooden box looks amazing and even snaps open and closed with a custom magnet system to ensure security. The L5 just feels special in every way and once you throw it you'll be hooked!